Relegation can dampen the spirits of even the keenest football supporter. But three such occurrences in just five years, combined with a profligate waste of some £74 million of parachute payments is a real downer. Morale had not been particularly high for Wigan Athletic fans over these recent weeks. But then came the announcement that local lad Jordan Flores had signed a new two year contract. It came as a bit of a surprise as there had been no news about the player for weeks. “Always good to reward one of our own” were David Sharpe’s words as he announced the new contract on Twitter. 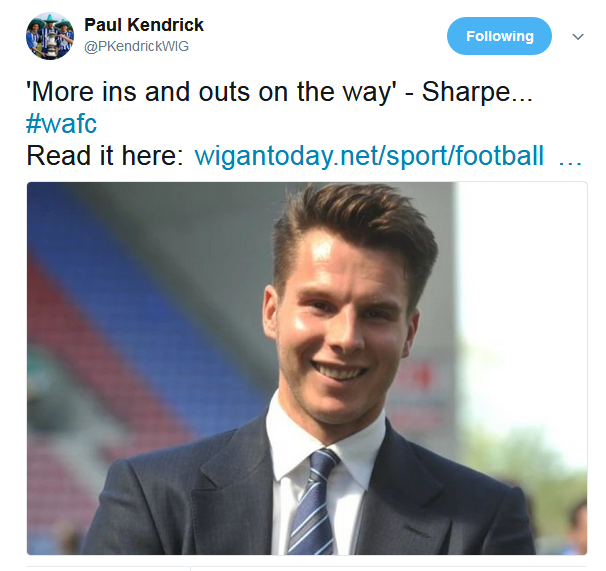 In one instant it brought visions of a future where Wigan Athletic would at last have faith in home-grown talent, rather than incessantly bringing in loan players. It raised the feel-good factor, at least for a while. Those words of Sharpe caused the alarm bells to ring. Did he really mean just two of the likes of Dan Burn, Will Grigg, Sam Morsy, Max Power or Nick Powell will be going and the others staying? A couple of years ago Latics had been relegated to League 1, but the chairman’s optimism over the summer of 2015 was uplifting. The famous quote about “smashing League 1 with 100 points” was a trifle overexuberant, but it set the tone over a summer of huge changes in the playing staff. Most of the high earners were sold off, paid off or loaned out, but the chairman played his trump card in paying up to £1 m for Will Grigg. The end result was that the budget had been massively cut, but with the parachute money the club was still able to offer above-average salaries to attract players more than good enough for the third tier. Sharpe’s positivity continued into the season and at the midway point he paid somewhere approaching £1 m to sign Yanic Wildschut on a permanent contract. The Dutchman and Grigg proved to be crucial signings as Caldwell’s team won the division title. Sharpe made efforts to keep the bouyant feeling obtained by winning League 1 by offering season tickets at levels well below the market rate. In the meantime Gary Caldwell started to bring in many more new players than he had previously predicted. The manager clearly did not believe the squad was good enough to survive in the Championship after all. There was no £1 m signing this time around, but ex-players Jordi Gomez and Nick Powell were brought in as marquee players on relatively high salaries. Caldwell’s team had a poor pre-season and his tactics in the early league games were conservative. The manager had reportedly wanted Callum Patterson from Hearts to solve the problematic right back position, but Wigan’s bids had fallen far short of the Scottish club’s valuation. Midfield player Conor Hourihane of Barnsley was also apparently on Caldwell’s wanted list but nothing resulted. The woeful decision by Sharpe to replace Caldwell with Warren Joyce was to ultimately lead a demoralised squad to relegation. The possession football we had seen under Caldwell evolved into “fightball” under the ultra-defensive Joyce. According to the Premier League website Wigan Athletic received £16,298,146 in parachute payments last season. Transfer fees paid out in summer 2016 were relatively modest. In January they jettisoned two of the highest wage earners in Jordi Gomez and Adam Le Fondre. Speedy winger Nathan Byrne was sent on loan to Charlton. The sale of Yanic Wildschut to Norwich was reputed to be in excess of £7 m including add-ons. It was rumoured that the wage bill at the start of the season was around £17 m. Joyce himself remarked on how he had reduced that wage bill by the January comings and goings. But the end-result on the field of play was the loss of a proven goal scoring centre forward, a creative midfielder who had previously proved himself to be a top Championship player and two wide players with searing pace. Some fans at the time had remarked that it looked like Latics were planning for relegation even in January. Since Cook’s appointment a couple of players have already left. Matt Gilks went to Scunthorpe who were able to offer him the kind of contract that Latics were unable or unwilling to provide. Jake Buxton was a rock in defence last season, but has already left the club by mutual consent. The departures of Gilks and Buxton can be seen as indications of the club lowering its budget, which it clearly needs to do, given its huge potential loss in revenues. Despite what the chairman is saying it would be a surprise if only two more of the present squad leave before the season starts on August 5th. The question is how Sharpe is going to use the remainder of the substantial revenues that came in last season? Will they be used to service the club’s debt? Or is he really planning to keep all of last season’s squad that remain, bar two? At this stage there is not the level of optimism among the fans that one would expect with a new manager coming in who has an impressive track record. The loss of parachute payments weighs heavily in our minds. Will Cook receive the level of financial and personal support from the chairman that is needed to get Latics back to the Championship? 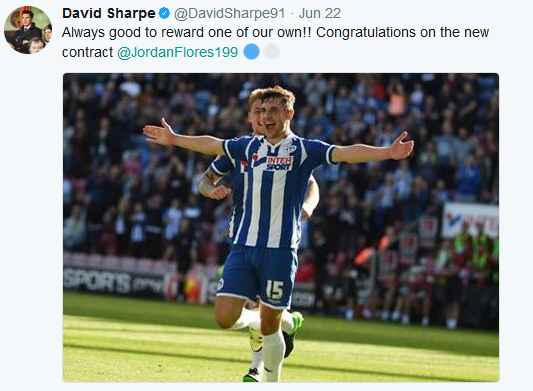 Sharpe’s gesture in offering an extended contract to Jordan Flores is certainly good PR and we can only hope that it is a sign that home-grown talent will be given a better chance to succeed than we have seen in recent years. However, the chairman needs to enunciate his broader strategy. What is his vision of what he wants for the current season and how he will achieve it? If he were to say that it was to be a period of austerity for the club, with any profits from last season used to pay off debts, few could argue with him if he is looking at the club’s long-term sustainability. If he were to say that he will have to make major cuts in the squad since the club needs to cut its cloth according to projected revenues, then once more it would be hard to argue against. David Sharpe has a difficult task ahead of him. Like all of us he has made some good decisions and some bad ones. 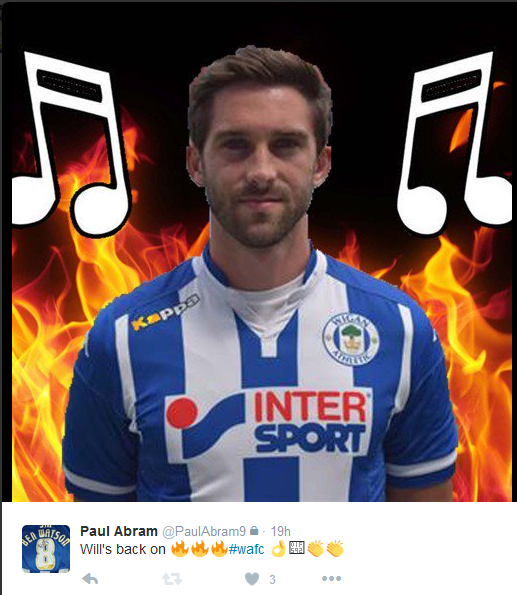 Perhaps his most redeeming quality as Wigan Athletic chairman is that he considers himself a fan, first and foremost. Moreover he is eloquent and very comfortable with the media. The coming season will be the acid test for the young chairman. Should he take a gamble and back the new manager with a war chest to get the club back to the Championship? Or should he look at financial consolidation and future sustainability? Without the parachute payments the feel-good factor has dropped alarmingly. How will the chairman deal with it? How many more loan players for Latics? 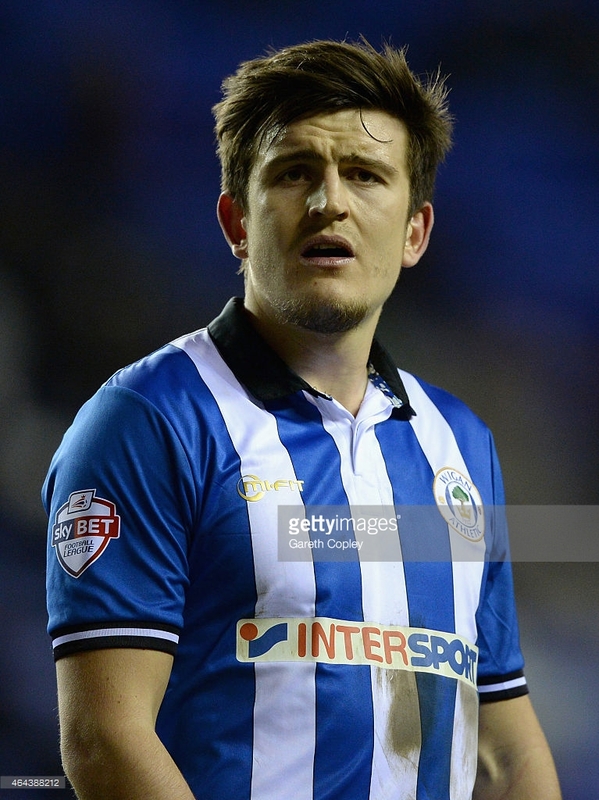 Maguire on loan at Wigan. “Hull City’s Harry Maguire signs for Leicester City on five-year deal” ran the headline. The fee associated with the move is reported to be some £12 m rising up to £17 m.
I must admit: it took me by surprise. Granted Leicester could probably use another powerhouse centre half in the ilk of Huth and Morgan. But has Maguire’s game improved that much since his spell at Wigan a couple of years ago? Is the price inflated? Harry Maguire was signed on a short term loan from Hull City in February 2015. He was without doubt Malky Mackay’s best loan signing, forming a rugged central defensive partnership with Jason Pearce. He was excellent in the air, powerful in the tackle, but does he have the passing skills to make it as a top Premier League defender? Only time will tell. Over the past three seasons Wigan Athletic have brought in no less than 30 players on loan. They have often been young players from higher placed clubs, being sent out for experience. Only 3 of those 30 went on to permanent contracts at Wigan: Emyr Huws, Stephen Warnock and Yanic Wildschut. A statistical analysis shows that the average age of the loanees has been around 24, the odd 30-pluses such as Alex Bruce, Alex Revell and Liam Ridgewell being balanced out by teenagers such as Marcus Browne, Callum Connolly, Jonjoe Kenny and Sheyi Ojo. The influx of loan players, particularly over the past couple of seasons, has been subject to much debate by Latics supporters. The clubs sending their players to Wigan on loan can make stipulations about first team opportunities for their players, with financial implications if they are not met. The situation with goalkeepers near the end of last season was perhaps the straw that broke the camel’s back as far as many fans were concerned. Moreover it has been felt that the presence of too many loanees has deprived the club’s own young talent of opportunities. However, a new manager has come in. Will we see any change in the use of loan players under Paul Cook? Last summer Cook made two summer loan signings for Portsmouth. The 36 year old goalkeeper David Forde was acquired for a season-long loan from Millwall, going on to make 47 appearances. Dominic Hyam, 20, was loaned from Reading, but made no appearances. Interestingly the January loan window saw Cook pick up Eion Doyle, 28, from Preston, who was to make 12 appearances. But the 19 year old Aaron Simpson, from Wolves, suffered the same fate as Hyam, making no appearances. Among the theories put forward by Portsmouth supporters regarding the manager’s surprise exit was that the new ownership would appoint a director of football. It was an idea mooted at Wigan too, but did not come into fruition. However, as manager at Wigan he will need to take a look at the link between the recruiting department and the coaching staff. Not only have experienced players been signed who have not made their mark, but those who could be loosely labeled “players for the future” have been given minimal opportunities on the field of play. The present squad includes players like Jack Byrne, Josh Laurent, Dan Lavercombe, Mikael Mandron, Sanmi Odelusi and Kaiyne Woolery. All were seemingly signed for the future but have made hardly a handful of appearances between them. They are in their early twenties and were bargain signings from other clubs. Danny Whitehead also falls into that category, although he no longer appears in the first team squad on the club website. Yesterday’s new signing Terell Thomas, 19, will hope that he will receive more opportunity than his predecessors have had. The current first team squad also contains six players who have come through the academy and the development squad – Luke Burgess, Callum Lang, Owen Evans, Josh Gregory and Christopher Merrie and Sam Stubbs. Last season Luke Burke made the transition to the first team, making an immediate impact at the start of the season. Sadly he was underutilized as the season progressed. The futures of the “players for the future”, both homegrown talent and those brought in from other clubs, will depend on them being given opportunity to develop. Some will be sent off on loan to other clubs to get more experience, but far too often in recent years such players have not come back to have an impact on the first team. So often loan players from other clubs have been given opportunities in their stead. An article from the Portsmouth News entitled “Pompey deny Wigan to retain coaches” has informed us that Robbie Blake nor John Keeley will be leaving Portsmouth, although physios Nick Meace and Andy Proctor may be on their way to Wigan. It says they are confident that head of player recruitment, Nick Howarth, will be staying. Cook is gradually putting together his coaching and backroom team at Wigan. With the pre-season looming he will be keen to get that sorted as soon as he can. We can only hope that there is a better connection between recruitment and coaching than we have seen at Wigan in recent years. Moreover that there will be a planned strategy towards the recruitment of loan players from other clubs, bearing in mind the presence of the club’s own young talent. The departure of Matt Gilks to Scunthorpe this week is indicative of the club being unwilling to offer him a contract as good as that put forward by the Irons. It appears that Gilks had a get-out clause in his contract in case relegation occurred. Having spent much of his career in the higher divisions he would have been accustomed to the kinds of salaries offered at those levels. Given such a scenario it is unlikely that Paul Cook will either be handed a large war chest for potential transfers, nor be able to offer salaries that give him a competitive advantage over other contenders in the division. Yet again it is a time of change at Wigan, this time involving wholesale changes in coaching and backroom personnel. Moreover we can expect considerable player turnover over the coming weeks, with an exodus of the higher earners. Of all 30 loan players at Wigan in the past three years it can be argued that Stephen Warnock and Yanic Wildschut made the greatest impact at the club. But Harry Maguire did a solid job and it remains to be seen whether he will ultimately be the most successful of those loan players in his career that follows. Will Cook’s loan signings play an important role this season? Or will he prefer to utilize players he already has at the club? Or will it be a healthy balance between the two? How many of the club’s most successful youth team will ever play for its senior side? Photo courtesy of Wigan Athletic FC. Critics of the loan system in English football say that it is there for the benefit of bigger clubs helping them to stockpile young talent. They cite the example of Chelsea as taking things to the extreme. At the beginning of this season Chelsea had no less than 38 players out on loan. Half were sent to English clubs, half overseas. In addition to those coming through their academy Chelsea buy up young talent from all over the world, typically sending them out on loan immediately to get experience. Some will come back and get a first team place, but for most the experience helps boost their market value and they are sold off. But clubs in the lower divisions are so often happy to take the loanees. Using a loan player over a relatively short period of time frees them from tying up their capital in long term contracts, which can be problematic if the club runs into financial difficulties. Moreover the clubs can use the loan market to cut wage bills by sending their own players on loans where other clubs pay their salaries. Andrew Taylor was signed for Wigan Athletic by Uwe Rosler in the summer of 2014 on a three year contract. He played 26 games for Latics in that first season, but has played no competitive games since for them. Last season was spent on loan at Reading, this season at Bolton. The loan system also provides a lower division club with the opportunity to assess a player’s capabilities prior to making a decision on a permanent signing. In Wigan’s case it enabled them to sign Yanic Wildschut from Middlesbrough in January 2016 after a three month loan period. It proved to be the most lucrative financial transaction the club has made in recent years, making a sizeable profit, even if critics might say it contributed to the lowly league position Latics now find themselves in. Reports suggest that Wildschut was signed for less than £1m and sold for a figure approaching £7m, although there may have been clauses in the deal made with Middlesbrough assigning them a portion of a future transfer fee. Nevertheless the club had used the loan system much to their benefit. But Emyr Huws had been brought to Wigan on loan in the summer of 2014, resulting in Latics paying Manchester City reputed to be around £2.5m near the end of the summer transfer window. An ankle injury in the early part of the season severely hampered Huws, leading to him making only 16 appearances in 2014-15. After expressing his desire not to play in League 1, Huws went on loan to Huddersfield Town the following season, only to sign for Cardiff City last summer for a fee in the region of £1m. Latics had made a considerable loss on Huws, although we can only surmise on what would have happened if he had not suffered that ankle injury, something that has continued to dog the player. Sometimes players are sent out on loan in the final stages of their contracts. Typically it is a way of helping them find future employment, when their contracts are not going to be renewed. Uwe Rosler signed Martyn Waghorn from Leicester City after a successful loan period in 2013-14. Stephen Warnock was given a permanent contract last summer after joining on loan from Derby County in March 2016. But Wigan Athletic have signed 32 loan players over the past three seasons, with only Warnock and Wildschut becoming permanent signings. The majority of the loan signings were made in the January window. Faced with mass departures in the fire sale of January 2015, Malky Mackay made seven loan signings, none of whom were to stay on at the club at the end of the season. Warren Joyce also made seven loan signings in January 2017. The sheer number of loan players signed by Latics over the past three seasons has led to fans questioning the policy. Why have so many loan players been signed, when such a tiny proportion have gone on to sign permanent contracts? Moreover if the club is serious about its Academy why has it brought in so many youngsters on loan from other clubs? Put simply, has the club been helping other clubs in developing their young players at the expense of home grown talent? The stats are damning. 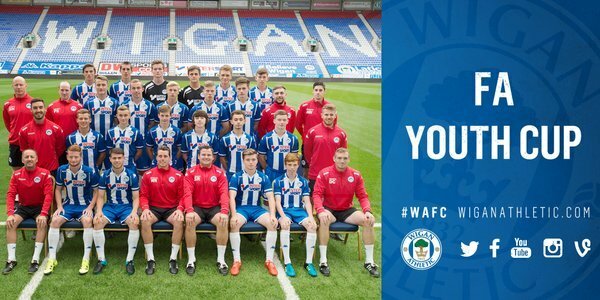 In the past three seasons only four graduates of the Wigan Athletic Academy/youth system have played in league matches for the club. They have made a combined total of 15 starts, with 12 substitute appearances. The most appearances were made by Tim Chow (6 starts, 9 sub), Luke Burke (4 starts, 1 sub) and Jordan Flores (3 starts, 2 sub), with Lee Nicholls making two end of season starts against Brentford and Barnsley. The case of Luke Burke this season is one seems to typify what has been happening. As an 18 year old Burke made a promising debut in the opening game of the season at Bristol City. He had come in seemingly full of confidence from a good pre-season and his success as captain of Wigan Athletic’s most successful ever youth team. However, as the season progressed Burke was to be marginalised, then sent on loan to Barrow. The right back position has continued to be problematic this season, with either midfield players put in there or young loan players brought in. They include Reece Burke (20), ostensibly a central defender, Callum Connolly (19) and Jamie Hanson (21). Wigan Athletic are by no means the only EFL club to use the loan system in such a way. It has become commonplace throughout the three divisions. However, given the focus on building a strong academy, bringing in such quantities of young loan players is surely detrimental to the development of the club’s own home-grown talent. Given the fact that Latics have been struggling against relegation since day 1 this season it is perhaps understandable why home grown talent has been so sparsely used. The irony is that last season’s youth team reached the fifth round of the FA Youth Cup for the first time, only losing in extra time to Manchester City. The club has arguably its brightest cohort of academy graduates. Will they continue to find their paths blocked by the presence of young loanees from other clubs? Another thorny issue faced by clubs bringing in loan players involves stipulations from parent clubs regarding game-time. In certain cases clubs will only lend out their players if they have a commitment that they will be given opportunities in the first team. Loans can involve fees and penalties based on appearances made. The omission of Matt Gilks in favour of Jakob Haugaard against Rotherham was a surprise. Moreover Graham Barrow was reluctant to discuss it at his post-match interview. Was it because of pressure from Stoke City to play the Danish goalkeeper now he is fit again? Or is there a game-time clause in the loan agreement that involves financial penalties if not met? With relegation beckoning many of Wigan Athletic’s squad will be looking at their futures. The last time Latics were heading for League 1 there was a huge clear-out of players over the summer, followed by Gary Caldwell signing fourteen new players, with another six coming in on loan. The same will surely happen this summer. Most of the current squad will most likely be gone, with lots of new signings and loan players brought in. But what kinds of opportunities will be given to the club’s home grown talent? The EFL Futures initiative has been set up to encourage clubs to develop young players through their academies. A sum of £750,000 per season will be shared out to clubs who field players under the age of 21 who are eligible to play for England (or Wales for Cardiff, Newport or Swansea). The cash rewards will be shared out pro rata, depending on the number of qualified players and appearances made. One wonders in what position Wigan Athletic will appear in the list of recipients at the end of next season? A couple of years ago to the week Dave Whelan said his goodbyes to the crowd before a home game with Leeds United. The man whose investment of time, money and belief had lifted a struggling club from the fourth tier to unbelievable success was stepping down as chairman. His 23 year old grandson was taking over. There had been quite a buoyant mood before the match had started as Latics had won their previous two league games. There was some degree of belief that Malky Mackay would be able to salvage the season and pull Latics out of the relegation zone. Sadly it was not to be, Latics lost 1-0 and were nine points adrift of safety at the end of the day. It took another month to sack the hapless Mackay, but by then the rot was truly set in and new manager, Gary Caldwell, was unable to turn things around sufficiently in the handfull of games that remained. Two years on from those dark days Wigan Athletic find themselves in a similar predicament. Another 1-0 defeat, this time against a poor Blackburn side. Sadly the credibility of the current manager, Warren Joyce, is at rock bottom. His woeful tactics and lack of positivity have taken the standard of football down to levels we have not seen for decades. It is hard to have belief in the manager given his negative approach and his unwillingness to embrace good football. I watched yesterday’s game on a live feed from Germany, where even the German commentator referred to Wigan’s approach as “kick and rush”. It was sad to see Joyce with his face patched up, present but not giving orders from the front line. The cynics had suggested that the manager’s illness was simply a ruse to avoid attending the fan forum during the week. It was clearly not and we all must wish him a speedy recovery. David Sharpe will need to make decisions about the manager’s position over the coming week. Last time he left it late to bring in someone new. Latics have only won one game out of the last six and are heading for League 1 unless something drastic happens very soon. Significantly, reports suggest that Dave Whelan was at the game yesterday against his old club. Sharpe and Whelan will surely need to do something about a situation where a manager has not only been struggling with his job but has a seemingly major health problem to cope with too. 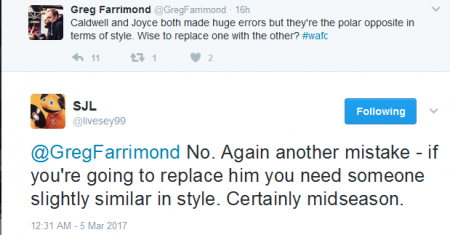 Should they opt to put Joyce on medical leave until the end of the season they would be helping both the club and the manager himself. In the meantime a temporary appointment could be made within the club to provide the kind of positivity and belief that is lacking at the moment. Embarrassing day for us. The chairman will surely now be questioning the change of manager. Looks more ridiculous with every game. He has to go before training on Monday. We are set up basically not to lose at all costs which isn’t working and as soon as we go 1-0 we struggle. Didn’t the Blackburn announcer said “Finally Wigan have made a substitution”? Who overruled the sub as we were clapping when we thought Tunnicliffe was coming off? It’s that embarrassing we can’t even make a sub correctly!!! For those not there it was genuinely that bad, both the performance, effort and the full time reaction from the fans, it went beyond discontent it was pure venom. Rational part of me says it went beyond what was acceptable- in fact it did but on this occasion I can understand why. Regarding that sub Tunicliffe actually left the pitch – in a strop – before being pushed back on – I’m not sure he should have been allowed back as the sub had been made. Grigg looked bemused, Bogle was not happy when they tried to hook him, fans were going berserk, other players were looking round wondering what was going on, it was an absolute joke. Truly dreadful setup. I don’t think we could play any less effective without trying to lose games. Asking Bogle to run the channels and come back on defense is a complete waste of his ability. Playing with wide players so deep, looks like 4 fullbacks on the pitch. Their not forward enough to be considered wingbacks. Never a pass available for the ball carrier. Cant describe how bad that is in words. This is against sides with weaker squads(even at best), this would never work against stronger opposition. It doesn’t work against any opposition. Yet Joyce must think under 20% win ratio is enough. Feels like an amateur vs a professional system, week in week out. 5 defenders in midfield and 4 defensive defenders. Bogle trying to play as a complete solo attack unit. Never going to work over a period of time. Without doubt Joyces tactics today. This system will relegate us from league 1 next season. With us only scoring a goal every other game this season its been a bloody awful season for supporters and most feel completely despondent I’m sure. Don’t think I’ve witnessed a latics team with such a lack of invention and it’s bloody pitiful to watch. Not one player can beat a player, create a killer pass, shoot well. It’s awful to watch and um surprised more haven’t boycotted what must be the worst Latics team in around 20 years. Depending on other teams games in hand, we could be 6pts from safety which is twice the gap when Joyce took over. I will take relegation now if it means I don’t have to put up with watching this sh.te every week in trying to survive in a league we don’t deserve to be in. Time for Sharpe to admit he screwed up yet again. We are absolute garbage,negative sh.te,we are going down. In the season was undoubtedly the sale of Wildschut, just after we’d won back to back league games, started creating chances and scoring and looking like climbing the table, we let our key attacking player leave. 4m upfront with over 1m going to Boro, with 3m in performance related installments, now Norwich have missed out on the play offs and are a total shambles and Yanic can’t get in the team and seems unsettled down in East Anglia, it’s unlikely to see us get anymore than 3m in the end. Was losing 6/7m or so a season in revenue, with relegation worth this panic sale? Yanic may have been bang out of order but if we’d have kept him and and agreed to sell him in the Summer, it would probably have kept us up. Without his pace and power we have absolutely nothing at all creativity wise. Whoever sanctioned the deal should probably resign. 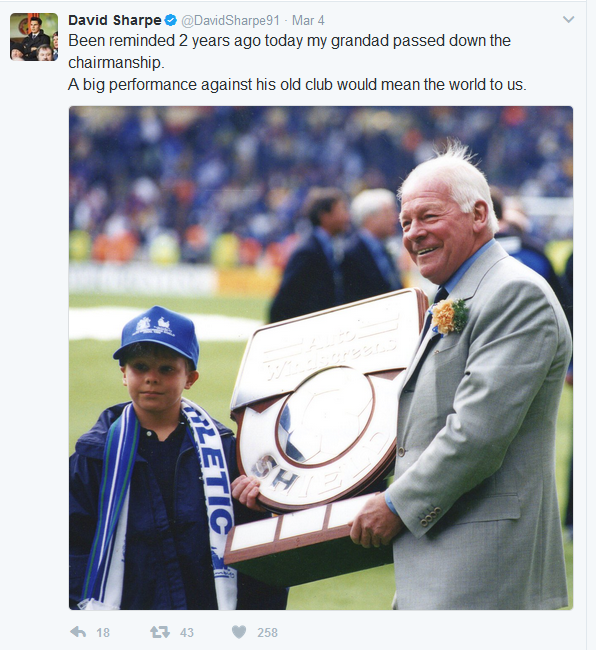 I for one have such a lot of gratitude for Dave Whelan and the journey we have been on but at the moment the journey seems to be going back to the lower leagues. There are the cynical amongst us who will think Dave has had other reasons than football too, like raising his own personal and business profile and having this profile shown to the world along the way. Who can blame him, the two have gone together. It could have cost a fortune to raise the business profile so much with stadium and shirt sponsorship alone. A huge chunk of money invested. Remember for all the money that he has put in Latics, Dave still owns millions in assets with the stadium and land etc and still the company name is flashed on TV every week. I just think it is a shame after taking us up there to be on the slide which could have been prevented with a fraction of investment again rather than perennial fire sales. Someone somewhere should be accountable for this ridiculous and downward spiraling of Latics and let us hope Mr Whelan can find them, stop them and do something about this slide. I hope he is patient because it is looking like he will have to start this process from league 1 and without a parachute payment which will need the right personnel and investment from the off. It will also require the ruthless side of his business life with a full clear out of most players, the chairman and board, the manager, all the coaching staff, all the hanger ons. Let the upward journey begin again Dave. Will Grigg scored his first goal in thirteen games yesterday to put Wigan Athletic ahead against Nottingham Forest as the half time whistle approached. After being written off by too many fans as a League 1 striker, Grigg showed the kind of opportunism that we had come to expect from him in the past. Providing he is not sold off in the transfer window we can expect more goals from a centre forward keen to show that he has the qualities to become a force in the Championship. After a run of disappointing results, spirits have been lifted, the only real downer of the day being a sparse attendance of 5,163, with some 1,500 coming from Nottingham. Haugaard signed on loan and straight in the team. Sam Morsy back and in the team. Craig Davies off to Scunthorpe. I think it looks like Joyce is starting to forge what he wants. I really enjoyed Sam Morsy’s performance today. His ability to play accurate forward passes and maintain the momentum of our play was a joy at times. Forest were very poor but still, I don’t think we’ve got anyone else who can play like that. If, as seems likely, it’s basically up to him whether he joins Barnsley now, then we can only regret whatever happened previously. However, as much as it appears on today’s performance that he would improve our current squad, it’s unlikely that he would play that well every week. Forest put him under no pressure when he had the ball and as we saw last season, he can fold very quickly when he is pressed very intensely. In the hurly-burly of an average Championship match, I fear he wouldn’t contribute as much as he did today. As to whether he will stay, Joyce said in his post-match interview that he’s told Morsy that “he’s my kind of player”. That, and a start today, may lead him to think that he will play more often for us than for them although he has played in his last six games for Barnsley. As ever it will probably come down to money. I can’t see us offering him a better contract but it may well be that he’s already earning more here than Barnsley can offer. If that’s the case, he may still be our player this time next week. He could make a difference and give the fans a lift into the bargain. May only be short-lived, but good to see Sam Morsy back in a Latics shirt. Mistake to let him go in summer. But only my two-penneth. Great, that. Midfield 3 superb. Showing what we are capable of. Morsy needs to stay if possible. Huge game next week now. Come on! Feel sorry for David Sharpe, he’ll take the pelters from the fans if Morsy goes when all he was doing was backing his manager at the time’s awful judgement. Having said that, I hope the young man has learnt a serious lesson regarding permanent fees inserted into loan contracts following this debacle. If Morsy decides to stay and helps keep us up, then for me he’ll become an instant cult hero at this club and deservedly so. 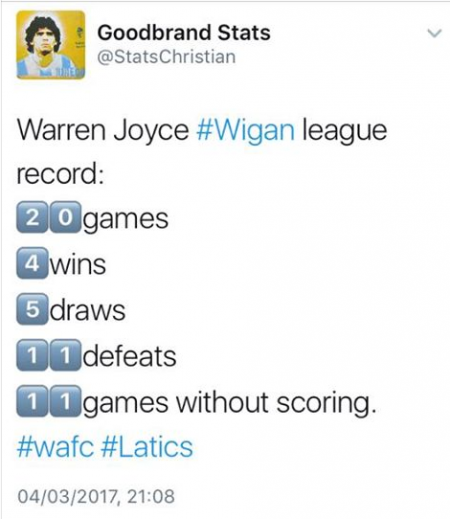 @LaticsSpeyk#wafc Worst PR ever. Loan Morsy out, recall him, play him in one match and sell him. Who thinks these things up ? But why pick a player for one game knowing he’s off the week after. Imagine your the player stood down for him. Not gonna make for a happy squad is it? I think Joyce must rate him and I would hope he’s had a word with the lad and convinced him that he is an integral part of his plans. Sometimes that’s all is needed its what the great man managers do . Just been looking on the Barnsley Forum and their fans don’t seem confident in signing Morsy, They’re saying that personal terms are the stumbling block they’re saying that Barnsley can’t and won’t offer the same money that we’re paying Morsy. Wonder how many of the folk moaning about the club spending no money will not be going today as it’s a tenner to get on and not in your season ticket …..
What a shame there was only 3500 Latics die hards there to see it. Embarrassing that so called fans can’t put their hand in their pocket for a tenner. The problem for me Tl4e is that we are not attracting pay on the day fans. We are only bringing in the season ticket holders and hence a game that has to be paid for as an extra is not appealing. I’m not saying this is the only reason but Wigan fans are fickle and have proved that over the years, until we start playing consistent and attractive football and start moving up the league I fear we will not see the floating “fans” back. Its a sad state of affairs I know but sometimes you have to take off the blinkers and see the truth of things.